Dr. Mondavi now offers a full spectrum of orthodontic treatments, including Invisalign and braces, which are quite different from one another. Dr. Robert Mondavi, dentist in Torrance, is now offering various orthodontic treatment options. Orthodontic treatment corrects misaligned jaws and teeth for healthier bites. When jaws or teeth are improperly aligned, the joint can become tender or painful. Speech may be unclear, and eating may be difficult. It can even be hard to keep teeth thoroughly clean. Orthodontic treatment eliminates these issues and creates healthy, balanced bites. Several options are available. Dr. Mondavi, Torrance braces expert, offers some of the most advanced orthodontic treatment options in the field. “One of the reasons I love being a dentist is that the possibilities with your teeth are limitless. The high-end technology that is available today enables me to give you an amazing, healthy smile. Because my staff and I are trained yearly on the newest, most advanced procedures, I’m able to exceed patient expectations,” said Dr. Mondavi, orthodontist in Torrance. The care his team offers is second to none. Braces are affixed to teeth while Invisalign aligners are removable. Patients do not need to change their diets during Invisalign treatment but may need to avoid certain foods with braces. Braces can correct virtually all orthodontic issues, including quite complex bite problems while Invisalign is best for treating mild to moderate bite issues. Invisalign is clear and designed to be invisible, but braces are generally made of metal and can be seen during treatment. Good dental hygiene and strict adherence to treatment recommendations are critical with both Invisalign and braces. Costs for both treatments are comparable, and insurance may cover part or all of the cost. Dr. Robert Mondavi is a graduate of the University of the Pacific. 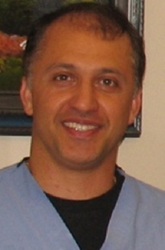 After receiving his DDS, Dr. Mondavi continued his education and completed several advanced courses, including advanced implant training and advanced cosmetic dentistry training. He has treated more than 5,500 patients over the last 12 years using a variety of treatments and procedures, including root canals, night guards, dentures, periodontal treatments, inlays, onlays, crowns, bridges, tooth-colored fillings, smile makeovers, Invisalign and dental veneers.